Marriage to a Roman Catholic? Matthew Cserhati presents a straightforward biblical approach to evangelizing Roman Catholics in his article: “How to Reach Roman Catholics with the Gospel.” As a former Roman Catholic, he has a great deal of experience in wisely presenting the gospel to his friends and others in that body. Danny Olinger continues his biography of Geerhardus Vos with its penultimate chapter, “Geerhardus Vos: Whither Westminster and Retirement.” He covers the reasons why Vos never taught at Westminster Theological Seminary, Vos’s relationship with Machen, his retirement, and death. I was especially appreciative of the space Olinger gives to Vos’s poetry, an aspect of Vos’s talents and interests of which few are aware. The recent spate of Confederate statue removals makes Darryl Hart’s evenhanded review of The Religious Life of Robert E. Lee by R. David Cox especially poignant. My poem this month, “Shadowbrook,” is a takeoff on William Butler Yeats’s “The Lake Isle of Innisfree.” Shadowbrook is a real place in Washington, New Hampshire, which I built as a retreat, sans electricity, running water, or cell coverage. 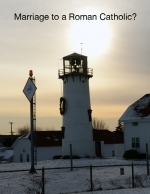 The lighthouse on this month’s cover is the Chatham Lighthouse on Cape Cod in Chatham, Massachusetts. Shore erosion forced the town to move the lighthouse back about one hundred yards. The day I took this picture we saw a Snowy Owl on frozen Bass River, where my sister lives. "What to Think of the New Pope" (D. G. Hart and John R. Muether) 23 (2014): 81-86.